How Can Cloud Technology Benefit Your Law Firm? Your data is securely stored in the cloud, so you can work from anywhere via your laptop, LEAP Mobile on your smartphone or the new LEAP iPad app. By eliminating the need for a server in your office, you not only simplify your IT requirements but save money on support costs. Your data is securely stored in a world class data centre - the same as the big banks. 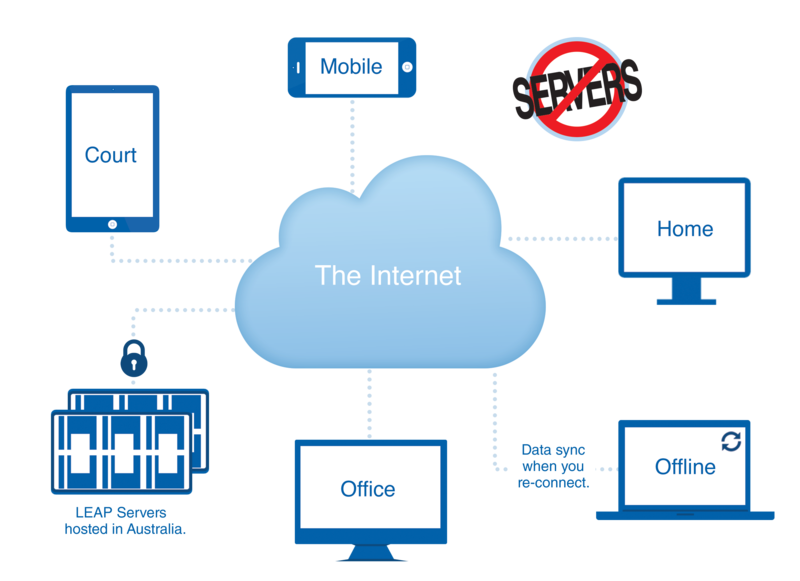 Your data is protected by security and encryption protocols to guard against interception. Your data is automatically backed up without you having to worry, eliminating disruption to your firm or any extra IT maintenance costs. Manage all your matters, time record client calls, scan documents and email matter correspondence, from your smartphone or iPad. LEAP seamlessly integrates with Microsoft Office, Xero and MYOB AccountRight so you can easily merge your matter details into any document, precedent, form or email. Attract and retain the best staff possible with technology that lets you work efficiently and collaboratively, whether your team are locally or regionally based. You can continue to use LEAP when you don’t have internet access. Getting started with LEAP is easy, all you need is a workstation for each user and the ability to connect to the internet. For a more detailed explanation of what you need to get the most from LEAP, download the LEAP System Requirements.